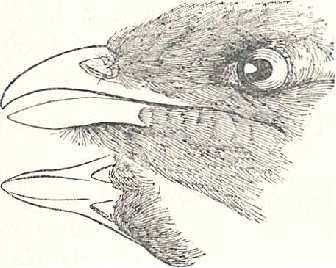 The Cuckoo was known in the UK in earlier days (around the 19th century and before) as the Cuckow. In Scotland the bird is sometimes known as the Gowk, a word which also indicates a fool or simpleton. The Common Cuckoo's method of foisting the incubation and upbringing of its chicks upon foster-parent birds makes this a fascinating bird to watch and study. After spending the winter months in Africa, the Common Cuckoo travels to Europe during late March or Early April. During the late Spring and summer it can be found in most European countries, even as far North as within the Arctic Circle. Once it has arrived at a suitable spot, it begins its song which so closely sounds like its own name. Both during the day and at night, the bird can be heard singing its distinctive tune, although as the months go by the frequency that the bird can be heard reduces, and it appears to prefer to shy away into the background a little. There may be good reason in this, as many smaller birds seem to chase the cuckoo similar to the way they would chase a hawk - the cuckoo's method of flying and visual characteristics being similar in many aspects. By the end of July, most Cuckoos have departed from the UK although a few may stay until the end of August or beginning of September. The main distinguishing characteristic between some types of cuckoo is said to be a difference in their song. However, there are some species with much more marked differences. Different members of the cuckoo family are found in Asia, Africa and Australia. Many are, like the common cuckoo, brood parasites, but some types do not shy away from their parental obligations. These include the Coua of Madagascar and the Coucal, both of whom build nests which although are not particularly elegant structures, at least serve their purpose. Similarly the Roadrunner (popularised in the old cartoons) is a member of the cuckoo family who is not a brood parasite. Two other species familiar in the USA and parts of the West-Indies are the Yellow Billed Cuckoo (Coccyzus americanus) and the Black Billed Cuckoo (Coccyzus erythropthalmus). Both of these species have been known to visit Europe sporadically. They build extraordinarily small nests compared to other birds of the same size, and incubate their dainty sea-green eggs attentively. The Lizard Cuckoos (genus Saurothera) and the genus Piaya, both found in South America, have been known as Rain Birds, a name apparently due to the belief that their song predicts rain. Another particularly interesting member of the cuckoo family is known as the Black Witch. Distributed throughout the Caribbean, this unusual type of cuckoo taks a completely different path compared to most other birds in its nesting and incubation habits. Rather than a single bird nesting with an caring for its own eggs, several Black Witches will band together and lay all of their eggs in a single nest. If a trespasser interrupts the peace, maybe 6 or so hen birds will scatter from the nest, seeking safety in the branches or a nearby hiding place. Another Cuckoo inhabits North Africa, Southern Europe and the Holy Lands, and is very common there. This is the Great Spotted Cuckoo (Coccystes glandarius or Clamator glandarius). 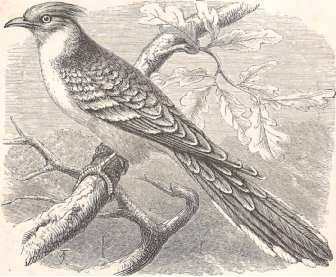 The birds belonging to this genus have been separated from the other Cuckoos because the feathers on the head are formed into a bold crest, in some species, such as Le Vaillant's Cuckoo, reminding the observer of the crest of the cockatoo: This fine bird measures nearly sixteen inches in length, and can be distinguished, not only by the crested head, but by the reddish grey of the throat and chest, and the white tips of the wing and tail feathers. This species lays its eggs in the nests of comparatively large birds, such as the rooks, crows, and magpies; and it is a remarkable fact, that just as the egg of the English Cuckoo is very small, so as to suit the nests of the little birds in which it is placed, that of the Great Spotted Cuckoo is as large as the average rook's egg, so as to be in proportion to the nests of the larger birds. The eggs of the Great Spotted Cuckoo can be so similar in appearance to those of the birds whose nest they have been placed that even expert ornithologists have been fooled by them.